The new edition of the best-selling employee development classic includes advice on talent retention in the gig economy and a new chapter on creating a career-development culture in your organization. 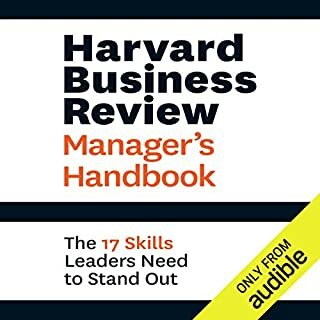 Clear and concise, this audiobook covers all the fundamentals you need for success, with indispensable advice on topics including hiring and firing, leadership, motivation, and managing time and stress. In addition, the completely updated fifth edition shows you how to build trust and confidence, be an active listener, manage a diverse group of individuals, conduct performance appraisals, and address many other challenges that come with the manager's job. 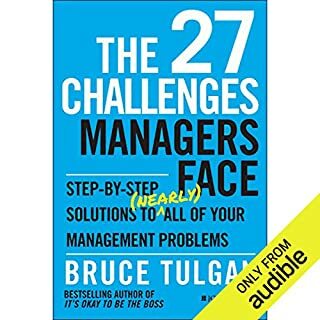 The 27 Challenges Managers Face shows exactly how to break the vicious cycle and gain control of management relationships. No matter what the issue, Tulgan shows that the fundamentals are all you need. The very best managers hold ongoing one-on-one conversations that make expectations clear, track performance, offer feedback, and hold people accountable. I’ve finished it in 21/03/19, let’s try it. 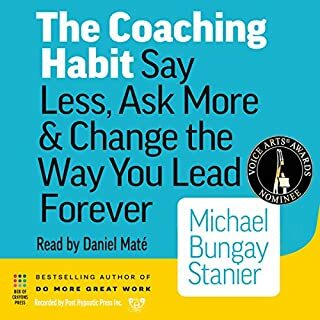 In Michael Bungay Stanier's The Coaching Habit, coaching becomes a regular, informal part of your day so managers and their teams can work less hard and have more impact. Drawing on years of experience training more than 10,000 busy managers from around the globe in practical, everyday coaching skills, Bungay Stanier reveals how to unlock your peoples' potential. He unpacks seven essential coaching questions to demonstrate how - by saying less and asking more - you can develop coaching methods that produce great results. Whether you're a new manager or looking to have more influence in your current management role, the challenges you face come in all shapes and sizes: a direct report's anxious questions, your boss's last-minute assignment of an important presentation, or a blank business case staring you in the face. To reach your full potential in these situations, you need to master a new set of business and personal skills. For decades The One Minute Manager has helped millions achieve more successful professional and personal lives. While the principles it lays out are timeless, our world has changed drastically since the book's publication. The exponential rise of technology, global flattening of markets, instant communication, and pressures on corporate workforces to do more with less - including resources, funding, and staff - have all revolutionized the world in which we live and work. If you listen to nothing else on becoming a new manager, listen to these 10 articles. We've combed through hundreds of Harvard Business Review articles and selected the most important ones to help you transition from being an outstanding individual contributor to a great manager of others. Great information for non-profit, too! Inappropriate attire, lateness, sexually offensive behavior, productivity and communication issues...these are just a few of the uncomfortable topics you may have to discuss with your employees. 101 Tough Conversations to Have with Employees provides you with proven guidance and realistic sample dialogues you can use to facilitate clear, direct interactions with your people, helping to sidestep potential awkwardness and meet issues head on. Having managed dozens of teams spanning tens to hundreds of people, Julie Zhuo knows the most important lesson of all: Great managers are made, not born. The Making of a Manager is a modern field guide packed with everyday examples and transformative insights you need to be the kind of manager you wish you had. So grateful for this book. First published in 1983, High Output Management by Andrew Grove is a management guide based on Grove's 15 years of managerial experience and knowledge as a cofounder, president, and chief executive of Intel. As Grove emphasizes in a new introduction to the book, globalization and the information revolution have dramatically changed the workforce, making people ever more replaceable and the market ever more competitive. Companies must adapt to these changes or face their own irrelevance and extinction. For decades, Peter F. Drucker was widely regarded as "the dean of this country's business and management philosophers" ( Wall Street Journal). In this concise and brilliant work, he looks to the most influential position in management - the executive. The measure of the executive, Drucker reminds us, is the ability to "get the right things done". This usually involves doing what other people have overlooked as well as avoiding what is unproductive. This audio is a synthesis of Stephen R. Covey's two-day interactive and intensive workshop on leadership. In this audio program Dr. Covey teaches managers and leaders how to define their contributions, develop greater influence, leverage hidden resources, give constructive feedback, and unleash the full potential of their team against critical priorities. Whether you're dealing with a problem employee or praising the good work of a colleague, you need to communicate in a way that promotes positive change in others. Giving Effective Feedback quickly walks you through the basics of delivering feedback that gets results. Whether you're a new or seasoned manager, your responsibilities can become overwhelming at times. There are days and new situations that will leave you feeling vulnerable. You don't know where to start or even what to ask! The Manager's Answer Book can help. In question-and-answer format, this easy-to-use guide provides information on many aspects of managing. The how-to guide for exceptional management from the bottom up. The Effective Manager is a hands-on practical guide to great management at every level. Written by the man behind Manager Tools, the world's number-one business podcast, this book distills the author's 25 years of management training expertise into clear, actionable steps to start taking today. First, you'll identify what "effective management" actually looks like: can you get the job done at a high level? Do you attract and retain top talent without burning them out? Then you'll dig into the four critical behaviors that make a manager great, and learn how to adjust your own behavior to be the leader your team needs. You'll learn the four major tools that should be a part of every manager's repertoire, how to use them, and even how to introduce them to the team in a productive, non-disruptive way. Most management books are written for CEOs and geared toward improving corporate management, but this book is expressly aimed at managers of any level - with a behavioral framework designed to be tailored to your team's specific needs. Effective managers are good at the job and "good at people". The key is combining those skills to foster your team's development, get better and better results, and maintain a culture of positive productivity. The Effective Manager shows you how to turn good into great with clear, actionable, expert guidance. ©2016 ManagerToolsPublishing,LLC. (P)2017 Audible, Inc. This book is fantastic and I fully recommend it to anyone who wants to build or improve their management skills. It covers the concepts that every manager needs to know and practice: building relationships, performance communication, asking for more and pushing work down. The guidance in this book is clear, specific, actionable and demonstrably effective. When I first started managing I had no clue what I was doing and all the guidance I found was generic, too general and not helpful (eg. "You should coach your people, and you coach them by coaching them, so get out there and coach them!"). The ideas and guidance contained in this book are the exact opposite. The recommendations are incredibly specific, make sense, and work! 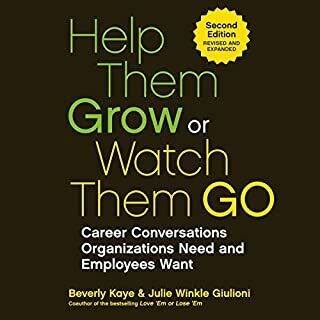 This book has detailed and actionable information on the things you can do to retain your people, deliver better results, and be a better manager. One of the points that this book makes that I really appreciated and found helpful is the idea that anyone can be a good manager. They just need to have the willingness to learn and apply that knowledge. This book contains that knowledge, with the experience to back it. If you apply what you will learn, you too can be a good manager. Arguably the best thing about this book is the huge array of resources available on their website at no cost. Hundreds of podcasts on nearly every topic related to management, friendly and helpful people in their forums, as well as numerous other resources. And all of it is actionable. Enjoyed the book there were many great points and stories. The only thing was there wasn't a lot of details or specific steps to implement them. It's truly wonderful to find a resource for step-by-step instructions. So many resources deal with theories. This one tells me what I need to do tomorrow. I have met both Mark and Michael Auzenne. My know them and their background. This book is written with a lot of care and thought after years of on the feet, active management in the rules they discuss. They have compile data from users, clients, their own organizations at all levels and The in valuable feedback from their clients of the Manager Tools community. The authors style is direct and six-inch being very results oriented and helpful without a lot of frothy anecdotal stories, jokes or silliness. This is a very matter-of-fact clean, concise yet easy to read guide for the professional. This book is a Sapir your guide for professional managers at any level in in any kind of situation. They are code of ethics and approach homogeneously covers every situation and with the book doesn’t cover in depth is backed up with their large library a free online content related to the book. I am thankful for this volume and have gained tremendous insights, chips, and tools to become a better manager. I could not be more thankful to the team and the author, Mark Horstman. The best manager training you will receive! perfect for the new manager, team leader. great tools to use for everyday management. and leading of a team. 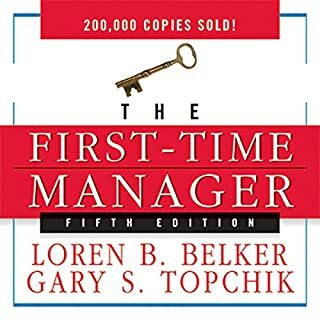 This book is a great guide to first time managers. It provides key issues that will make you a better manager. For you and your team. I recommend it to all managers at different levels. It's my go to for guide and refreshing the basics of management. Fabulous breakdown of the mysteries of management! Great content and great performance. Will be back over this material many times, I'm sure. I do miss hearing Marks voice from the podcast. The narrator is fine I just got used to mark telling me the hard truths. Also loved the princess bride nod. I loled while listening at the gym. 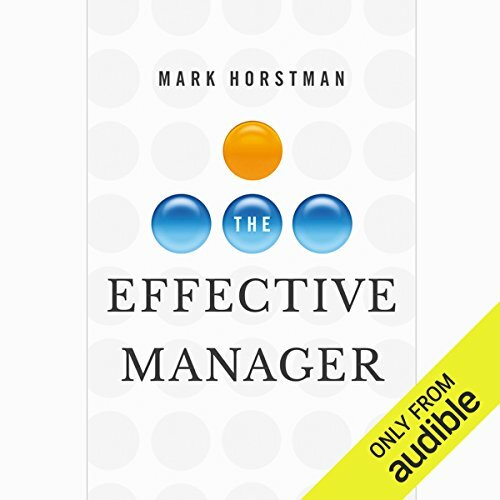 For a newbie (like me) or a seasoned manager, this book gives you the tools you need to be a better more effective Manager and how to get the most out of your staff. 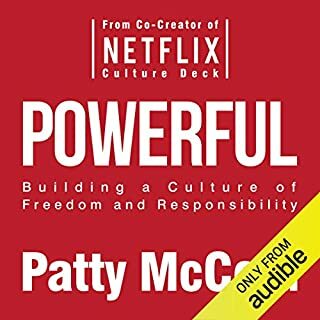 This audio book realigned the way I look at management. The support casts are worth 10 paid audio books. Well worth time and read 5/5 overall. Only gave this book a 4/5 for performance due to narrator being a little mechanical.